In May 2016, Evernote unveiled their Evernote + Google Drive strategy (show video). I am a heavy-duty users of Evernote and I work at a university that is a "Google school." Naturally, I have utilized this integration a lot. In this post and others to follow subsequently, I wish to share a number of workflows that not only utilize the integration with Google Drive, but also other ways in which I make use of Evernote and Google Apps together (including a few tips & tricks with Gmail, Web Clipper, emailing into Evernote, etc.). 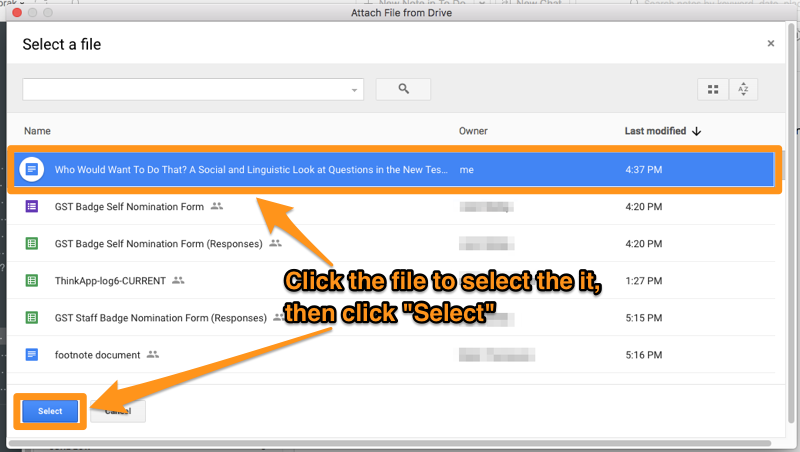 I'll begin in this post with what might be the simplest and most straightforward workflow, namely, linking files in Google Drive to to-to items in my task list (which I keep in Evernote). My instructions pertain to Evernote for Mac. As always, if you've got a workflow you'd like to share (or see how mine my be even more efficient), post your comment(s) below. Later this year in November, I will travel to Boston to participate in the annual meeting of the Society of Biblical Literature. I will be reading a paper in one of the sessions of the Greek Language and Linguistics unit. My paper is about the sociolinguistic function of questions in the New Testament (insanely interesting, right?!?). To make sure that I will actually get the paper written in time for the conference, I've created a to-do note in my To Do notebook in Evernote. I've added tags and set a reminder (i.e., due) date for the task using the Evernote's built-in features for doing so. Now, I know that finding this document in Google Drive is not horribly difficult. The search feature is, not surprisingly, very powerful, and if I've accessed the file recently, a quick access link to the file will display in the new Quick Access feature in Drive (unless you've turned it off because it's big and takes up valuable screen real estate). However, I want to be even more efficient by putting a link in one place I know I can find it and access it with a single click, namely in the to-do note I've created. 1. In the note interface in Evernote, click the Google Drive icon in the toolbar. This will launch a window that will allow you to search and/or browse for the file you wish to attach. 2. Locate the file you wish to link. 3. After selecting the file, click the "Select" button. This will insert the link to the file into your Evernote note. If all is well, you should see a stylized link embedded in the body of your Evernote note as follows.